Cerritos City Councilmember Mark E. Pulido was recently honored with the inaugural APAICS Trailblazer Award from the Asian Pacific American Institute for Congressional Studies (APAICS) for his achievements in public service. Congresswoman Linda Sánchez, a member of APAICS, presented the award to Pulido at a special May 8 event held in Washington D.C. as part of the APAICS celebration of the 20th Anniversary of Asian Pacific American Heritage Month. “I am humbled and honored to have received the APAICS Trailblazer Award. It was also a tremendous honor to meet President Obama. I was pleased to invite him to visit the City of Cerritos and experience our thriving multi-cultural community,” Pulido said. 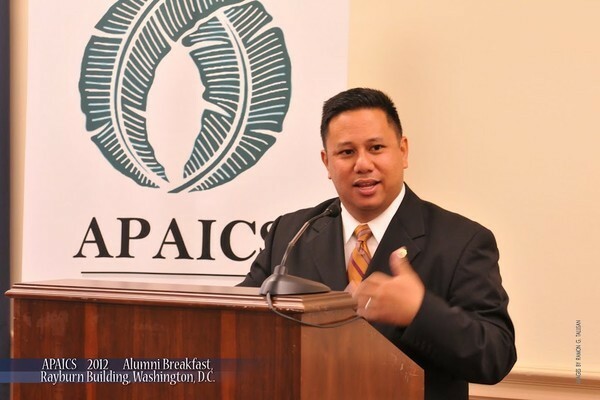 Pulido is an alumnus of the APAICS program and was selected to receive the first APAICS Trailblazer Award for his achievements in public service. Pulido, a longtime Cerritos resident, was an ABC School Board member before being elected to the Cerritos City Council in March 2011, when he drew the most votes ever recorded in the city’s election history. He is also the first Filipino American on the Cerritos City Council. The APAICS celebration of the 20th Anniversary of Asian Pacific American Heritage Month drew the largest gathering of Asian Americans and Pacific Islanders (AAPI) ever in the nation’s capital. An estimated 1,000 AAPI community, government, arts and business leaders attended this year’s celebration. APAICS is a national non-partisan, non-profit organization dedicated to promoting Asian Pacific American participation and representation at all levels of the political process, from community service to elected office. This entry was posted in Uncategorized and tagged cerritos, filipino, filipino american, mark pulido, obama by rbvergara. Bookmark the permalink.